With offices under increasing pressure to become more environmentally friendly, we showcase some of the UK workplaces that are setting the standards in green design. When an office building was erected on the outskirts of Leeds in 2007 it was hailed as the greenest so far seen in the UK. The Innovate Property office, which cost around £5.5 million to build, was awarded the highest ever Building Research Establishment Environmental Assessment (BREEAM) rating. Five years of planning had gone into creating this modern benchmark for office sustainability. The effort has proven worthwhile; in the space of a year, the building produces as little CO2 as 16 houses, an incredible statistic when you consider that most commercial buildings generate as much as 75. So what are the significant aspects to its green design – is the outside covered with solar panels and wind turbines? Interestingly, Cardiff-based Rio architects avoided such green building familiars, dismissing them as expensive and inefficient ‘green jewellery’. Instead the key green features of the Innovate Property office are rainwater toilets, a green roof, recycled mobile phone panels and 100% recycled aggregate. The building was also constructed with 65% and 80% recycled cement. Praise for innovate green design is not limited to Leeds, there are many other environmentally-friendly UK workplaces that are setting the standards. In line with its commitment to preserving the beauty of the UK, National Trust headquarters in Swindon has the environment close to its heart. The array of photovoltaic panels covering the roof help keep the building’s CO2 emissions 65% lower than average. The office also utilises eco-friendly materials in its design, including PVC-free linoleum and water-based paints. Some extra smart design features include carpets that are made from wool from the National Trust’s own sheep flocks and ventilation snouts made from recycled beer cans. Another organisation that you would hope to be leading the charge in green design is the Eden Foundation, which created Cornwall’s Eden Project to encourage the appreciation and conservation of the natural world. 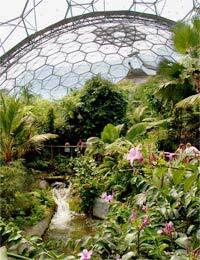 The Eden project’s office certainly lives up to creator’s ideals. It uses old newspapers to insulate the floors, walls and roof, making it one of the best insulated buildings in Britain. Timber columns raise the building off the ground in order to reduce the amount of un-eco-friendly cement needed to build it. Furthermore, the office is completely PVC-free. When building services company NG Bailey opened its Scottish headquarters it hoped that by showcasing a number of features that save or create energy, it would introduce its customers to the possibilities of green offices. Whether it customers take any notice or not, the HQ has certainly turned the heads of the energy assessors, who awarded the building an Energy Performance Certificate A rating. One of the key design features is the focus on the maximisation of natural light in order to offset the energy used to power its electric lighting. For instance, the exterior of the south facing entrance foyer is almost entirely made of photovoltaic glass and the roof of the whole site is riddled with skylights. The construction also features an ingenious computer operated air conditioning system, roof solar thermal collectors that heat the water, and a rainwater harvesting system that is used to flush the toilets. The combined effect of these energy saving methods is expected to save the company £3.3 million over the projected 60-year lifetime of the building. All these offices boast innovative and cutting edge modern design, but one British company has taken a different route on the road to sustainability by recycling old designs. Waste removal firm ‘Any Junk?’ claims to be the most authentically green office in London. In keeping with the company’s mission statement of promising to recycle or refurbish at least 50% of the rubbish it collects, the office headquarters is largely comprised of items that have been reclaimed from the tip; desks, chairs, telephones, stationary, mugs and even old tea bags. So not only is its office made up of recycled materials, but the firm is also responsible for recycling other people’s rubbish, most of which would otherwise be destined for landfill. How One Employer Became Britain's "Best Green Company"